The principle woodwind of Classical antiquity is the aulos, consisting of a pair of cylindrical pipes with double reed mouthpieces. Originally made of reed stems, wood, or bone, at the Hellenistic age it became a refined instrument with an ivory core covered by a delicate mechanism of bronze or silver sliders and turning sleeves, which enabled the player to control a considerable number of finger holes. While earlier instruments played simple scales within a constricted range, these expensive new professional auloi provided for modulation between different keys, and gave access to especially low notes as well as to a high register of shrill sound. The instruments heard in the following experimental soundings were reconstructed in projects of the Austrian Academy of Sciences. Wooden aulos: Prelude and accompaniment to Athenaios, Delphic Paean (start). The entire recording is available in: S. Hagel / Ch. Harrauer (edd. 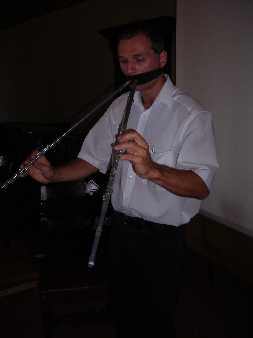 ), Ancient Greek Music in Performance, Vienna 2005. Note that the range exploited on both pipes can only be accessed with the help of sleeves and sliders. In this passage of the composition, performed at Delphi in 128 BC, the accompanying aulos is mentioned, and the vocal melody, whose score is preserved, mimicks the typical undulating, largely conjunct, motion of this instrument. It is therefore very likely that one pipe of the aulos redoubled the melody. Again, this is not possible without the mechanism. In the auletic art, higher registers were used only for the purpose of special effect (syrigmós, "whistling"), e.g. to illustrate the combat between Apollo and the Pythian dragon. If different harmonics are employed, trumpet-like effects are possible. The sound example experiments with several techniques. © Stefan Hagel, 2006. All rights reserved.